Take a good look at the picture below. In particular, take a look at the house on the right-hand side – the one with the single blue shutter. A man and his dog are trapped inside. The water is just a few steps from their refuge on the second floor. The dog can’t swim. No rescue officials know they are there – nor does the man taking the picture. At least not yet. The photo was taken the morning of Saturday, October 8, by Quavas Hart. 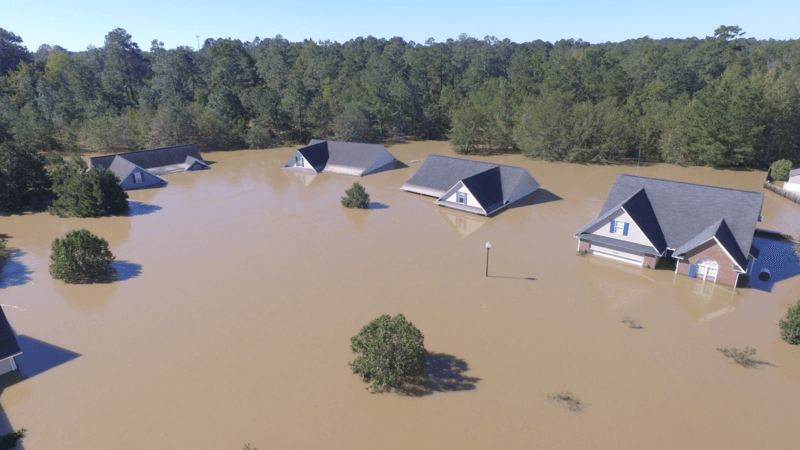 The 30-year-old from Hope Mills, North Carolina, had the foresight to charge his two Phantom 3 Professional (P3P) batteries before Hurricane Matthew struck the day before. A former paratrooper with the 82nd Airborne Division, Hart hoped to be able to use his Phantom to document the hurricane’s devastation and somehow serve his community. That Saturday morning, despite initially strong winds, he threw his Phantom backpack in his truck and drove four to five miles from his home to dry ground near this location. There was no shortage of other places for him to shoot – but felt drawn as if by some unseen magnet. “There was something pulling me to that neighbourhood,” he told us. He got out, put the P3P in the air, and snapped this powerful photo. Soon afterwards, after driving to another location, Hart Tweeted an Instagram photo from his @ImSoFirst account using the #Matthew hashtag and the name of the town: #HopeMills. Halfway across the country, in Texas, an anxious Craig Williams was searching the #Matthew and #HopeMills hashtags. His brother, Chris, lives in a home that had been in Matthew’s path — but Craig was not yet aware of just how directly he’d been hit. Chris had been trying, unsuccessfully, to reach 911 to arrange for help but the lines were jammed. Craig didn’t know any of this – and had no idea his brother was in distress. He flipped the image to Chris via smartphone, remarking that at least he wasn’t in a situation as dire as that depicted in the photograph. But Chris realized, in an instant, he was looking at his own house. He told his brother to find the person who had taken the aerial photo to see if they could help arrange an urgent rescue. Craig Williams immediately tried to reach Hart via Twitter. “His brother makes contact with me,” recalls Hart, who jumped back into his vehicle and returned to the neighborhood. “So I talked to him on Twitter, and got his number… and went back to make sure it’s him.” He popped up the Phantom 3 again, and this time saw Chris Williams stick his head out the window. Hart immediately started working on trying to find a boat to assist with a rescue, when he spotted a lifesaver: “This FEMA guy comes outta nowhere — from way out in the woods, with a boat,” says Hart. “And I fly the drone down there, and he sees us, and we start yelling at him. And then he comes over towards us, and we lead him (with the drone) right over toward the guy’s house.” The drama unfolds (and there’s plenty of it) at 3:14 of this video. Not long afterwards, with the Phantom battery basically drained, Chris Williams and his dog were safely aboard the FEMA boat. They were fortunate. As of Tuesday evening, Hurricane Matthew had claimed 33 lives, including 14 in North Carolina. Once the story hit the internet, media outlets from around the world began contacting Quavas Hart. 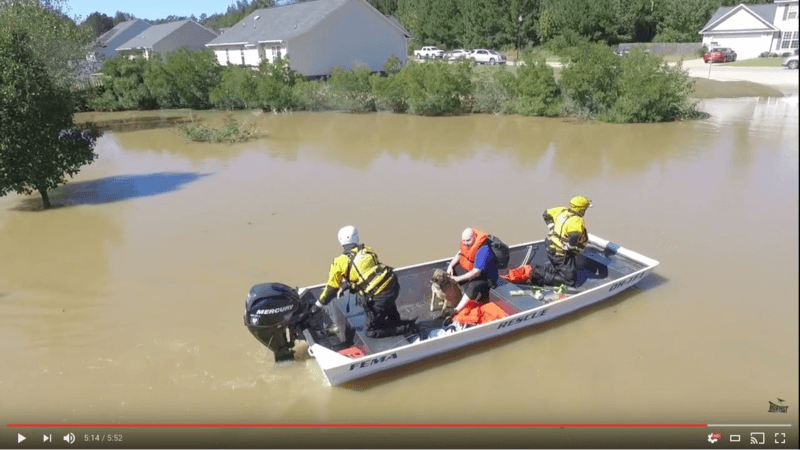 They wanted to hear the details of the incredible story — and how the power of social media and a drone had worked so rapidly to initiate this rescue. Hart accommodated those requests, asking for nothing in the process. But the place he really wanted to share his story with was DJI, so he contacted us directly. Diagnosed with Post Traumatic Stress Disorder following tours in Afghanistan and Iraq, Hart explained he used the GI Bill to go into film school. And what he found appealed to him—perhaps because of his paratrooping background—was aerial photography and videography. 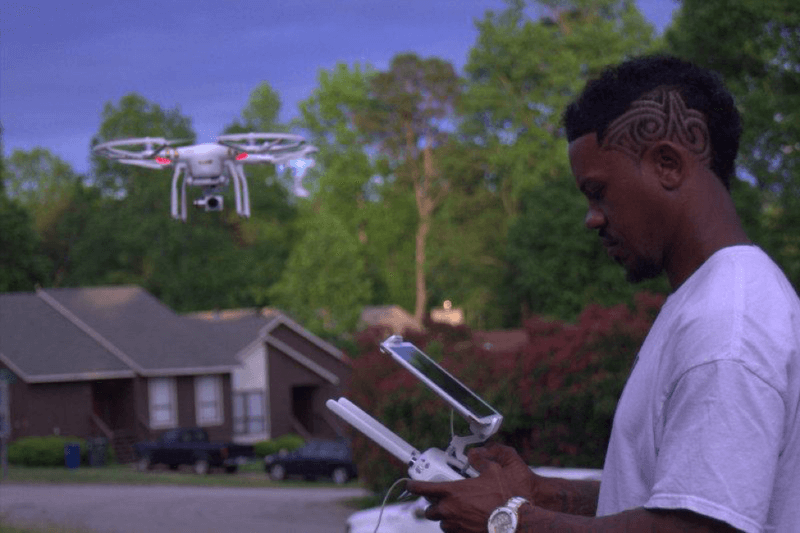 Also, because of a background in technology, he was drawn to DJI products. He’s owned every model since the first Phantom through to the Phantom 3 Professional, as well as the handheld Osmo. As a combat veteran with PTSD, Hart says it was difficult to transition back to civilian life. But once he discovered DJI products, he says, it was almost therapeutic. He was fascinated by the technology and loves seeing the view through the lens of a Phantom, feeling that it gives him a new, optimistic vision of the world. “There are other drone companies out there, but DJI is the company that I will keep in my heart forever,” he says. As for this particular experience? What it fate had not guided Hart to that neighborhood. What if he had not tweeted this particular picture? “The guy said it himself: He said ‘I probably couldn’t have made it through another night of that.’ He didn’t say he would have died – but I honestly don’t know. I just know that he wouldn’t have got rescued at the time that he did get rescued, the rescue might not have made it there… Who knows?